Dr. Alamo provides 1 Class, Class 2 and Class 3 Airman Physicals at Alamo Medical Clinic. Being an avid aviator for the past 30 years, he received his Private Pilot Certificate at the age of 19. Dr. Alamo is also an active Commercial Multi-Engine Pilot and has owned/operated 4 different aircraft including a turboprop currently used for business and pleasure. Having the experience, skills, and incredible passion for flying makes Dr. Alamo a perfect fit as an AME Certified Physician for Airman Physicals. He understands the time constraints with scheduling physicals for pilots; that’s why Alamo Medical Clinic is an Airman/Pilot friendly environment. 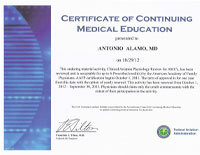 Please call the direct Airman line at (702) 456-8182 to schedule your exam with Dr. Alamo. Please let the staff know if you will need a Class 1, Class 2 or Class 3 medical certificate. Download and read how MedXpress works. * If you choose to present the day of your visit, please allow extra time for Dr. Alamo to review before beginning the exam. 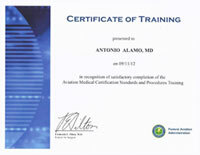 The Jan/Feb 2013 issue of FAA Safety Briefing focuses on aerospace medicine. Articles explain the FAA ’s responsibilities, cover key issues that affect medical certification for pilots, and discuss the pilot’s role in this process. Download a list of medications accepted by the FAA. In the United States, there are three classes of medical certifications for pilots; such certificates are required to legally exercise the privileges of a pilot license or certificate.